Kerry’s currently earning a 9.9% adjusted operating margin – this masks an improving 12%+ margin on Ingredients & Flavours, versus a sub-8% margin on Consumer Foods. Continued investment & revenue growth should see further operating margin improvement – but it promises to be a hard-won battle, as revenue growth remains anaemic. [2012 revenue growth of 10.3% seems an outlier – 2008-2011 revenue growth was only 3.5% pa, while the latest interims confirm a mere 1% growth rate]. Noting the never-ending exceptional expenses, plus continued shortfalls in operating free cash flow, a 0.875 Price/Sales multiple remains perfectly adequate. Net interest’s currently at 11.0% of operating profit, so Kerry could easily take on another EUR 470 million of debt (for example, to fund acquisitions) without impairing its financial stability, or impacting its valuation. As usual, let’s cut that figure in half (to be conservative), and add it to our P/S valuation as a (positive) debt adjustment. As anticipated, ICON’s recent (large) contract wins are now feeding through the P&L very nicely. The company enjoyed 15% Q4 net revenue growth in Q4, and even better 20% FY growth. This has been accompanied by the expected expansion in margins – at 11.2%, ICON’s Q4 operating margin’s finally back to normal. It also booked $446 million of net new business, for a 1.3 book-to-bill ratio in the latest quarter, and a backlog of 3.1 billion. Considering the company’s very healthy cash flow & revenue growth rate, its current operating margin now deserves a 1.2 P/S multiple. ICON’s also got 321 M of net cash on hand, and huge scope to lever up its balance sheet (particularly with a 3.1 B backlog). I calculate 385 M of debt would put net interest expense around 15% of operating profit – let’s count just 50% of that debt, plus 100% of available net cash, and include it as a (positive) cash/debt adjustment to my P/S valuation. Currently trading on 22.9x FY-2014 guidance (of $2.125), ICON looks fairly over-valued to me – but with US big pharma stocks generally back in favour, and the biotech sector on fire, it’s no great surprise to see a high valuation here also. Despite doubling in past 16 months, Total Produce still offers some decent upside. I actually added to my position last month, once TOT broke clear of its EUR 0.83-0.88 resistance zone. The stock’s been slow to build on its gains since, but final results are due in a couple of weeks & there’s little in the way of technical resistance overhead (aside from the psychological EUR 1.00 level). Ryanair’s passenger count is now running at an incredible 81.6 million pa! With the approval in June of its new Boeing order, the company’s now targeting 110 M passengers pa by early 2019. This launches a new growth phase that’s long been anticipated by investors – actually, they can have their cake & eat it here, as management also committed to returning up to EUR 1 billion to shareholders (via buybacks & special dividends) over the next 2 years. This step-up in its growth plans also heralds – if you can believe it – a new/more cuddly Ryanair! They’ve introduced better customer service, a new digital strategy & website, and are even wooing the business traveller by accepting corporate/group bookings & the Amex card. While Ryanair can be counted on to produce relentless passenger growth (running at 3-6% yoy right now), its fares & yields are the bane of investors’ lives – they’re often heading in the opposite direction. We saw this last September, as management first warned FY-2014 net profit would be at the lower end of guidance (570 M). This was quickly followed (in November) by a full-blown profit warning, with guidance reset to 500-520 M, due to lower fares & yields. [Which I calculate should produce a diluted FY EPS of approx. EUR 0.36]. Funnily enough, November also marked the recent nadir in the share price, which has since bounced by 40%! Ryanair’s operating margin has retraced accordingly, currently standing at 13.2%. While I’m pretty confident of continued passenger/revenue growth, it’s not necessarily clear RYA can expand margins on a sustainable basis either. I’ll continue to assign a 1.33 P/S as a fair multiple. Noting net interest expense is currently at 10.3% of operating profit, we can also incorporate a debt adjustment to our valuation. I calculate a further 621 M of debt would keep this ratio within 15% – as usual, let’s use only 50% of this additional debt figure. This is more than conservative – the balance sheet actually boasts over 2.8 B of cash right now, which earns precious little income (i.e. a large cash payout would be pretty immaterial to net interest expense). [Obviously, this cash will be mostly retained for upcoming Boeing purchases]. For this reason, I’ll ignore the 55 M (approx.) of cash spent on share buybacks since Q3, but recognize the reduced share count. Let’s also add in the value of Ryanair’s 29.8% stake in Aer Lingus (AERL:ID) – as expected, it now seems pretty certain they’ll be forced to sell out eventually. I’ve owned Ryanair, on occasion, but it usually looks fairly over-valued to me – as we see here. Frankly, I’m surprised how strongly the share price has bounced back in the past 3 months, as the company hasn’t flagged any kind of turn-around re fares & yields. With final results not due ’til May, I wouldn’t be surprised if we see better buying opportunities…though investors may end up competing with the company’s own buybacks. OK, where’s the hidden camera – this is a joke, right? But Clontarf’s a listed company, it must have some shareholders. But how on earth did they end up invested here?! Well, it’s not really an investment, it’s more like a global magical mystery tour… Which stops off in Peru, Bolivia & Ghana – all that’s bloody missing is maybe North Korea. Oh wait, believe it or not, that’s already been done – by another Irish junior resource company, of course! Hmmm, maybe Myanmar would fit the bill instead – definitely a hot market right now. So, what’s crazier than a junior Irish resource company valuation? Yes, you guessed it…AIB’s valuation! I’m amused to look back & see I asked ‘who the f**k is buying the shares on a EUR 31 billion valuation? !‘ two years ago. Er, silly question really – I now realize it was the investing geniuses who knew AIB would end up trading at a EUR 70+ billion valuation in 2014! Oh Lord, I’m not sure which is more difficult – taking CLON or AIB seriously? As usual, it’s quite satisfying to say: I blame the bloody government, and their 99.8% stake. But I also despair of the investors who trade in that last 0.2% sliver of the bank. How many arbitrarily decided to invest in AIB instead of Bank of Ireland (BKIR:ID), for example…maybe just because the share price looked ‘cheaper’? The bank continues to make some balance sheet improvements – its loan-to-deposit ratio’s now down to 106%, while total equity’s at 8.8% of total assets. 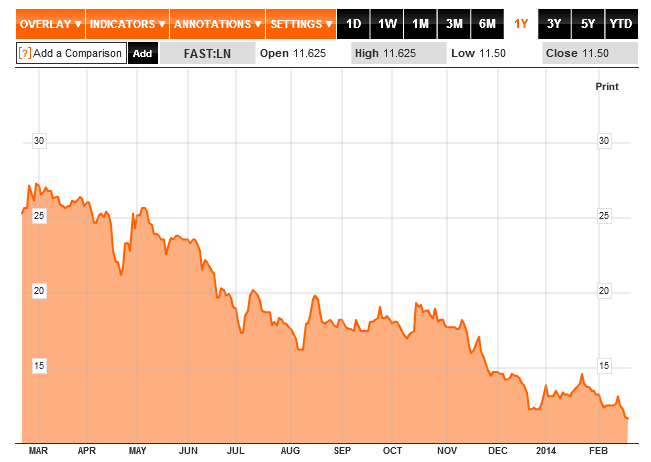 [In my opinion, this is the key bank equity ratio you should always focus on – look for a minimum of 8-10%. And you’ll have to calculate it yourself – just ignore all those other (superior) ‘risk-adjusted’ ratios banks love]. Net interest margin also improved to 1.28% (1.42% if you exclude the effect of ELG & NAMA senior bonds), but unfortunately this still falls way short. Despite significant staff cuts, this means underlying profit (exc. another cool billion expensed in H1-2013 on loan losses/provisions & exceptionals) still equates to a sub-5% return on equity. [Exclude tax credits, and it’s a mere 3.1% RoE]. Providence was a bit of fun last year – the latest set of O’Reilly muppets were suitably outraged by my call for a 41% share price decline. [From a long-gone GBP 615p…ooh, that smarts!] I was kind – in the end, PVR collapsed by a gob-smacking 64%! So the muppet chorus about Providence & its blockbuster assets, which I was obviously incapable of understanding (or valuing), is that much funnier now… They completely missed the point – I wasn’t necessarily disagreeing with the substance of the company, I simply (& emphatically) disagreed with the market valuation of its assets. [And they might have remembered I was actually bullish on PVR in 2012!] That’s the problem with mumpty chumps – they believe every little seismic whisper’s a bloody winner, and then compound their error by wildly over-valuing each supposed windfall. Now would you look at that, PVR’s offering some very decent upside again! But hey, as the muppets would opine, what the hell do I know about resource stocks? And presumably we remain in diametric opposition…so um, out of sheer bloody-mindedness, does that mean they’ll now be rooting for a lower PVR share price?! Wexboy, I like your approach in general but am a little puzzled by your analysis of SLE…have you not ignored the substantial value in Poland? Like most junior resource companies, I suppose – they always have millions & billions of contingent & prospective boe up their sleeves, and yet 90% of the time nothing ever comes of it. Probably the same outcome for the million boe potential down the bottom of my garden really… Quite sensibly, I think, I place little value on such ‘assets’ – which means I might miss out on a blockbuster occasionally, but I also avoid pretty much all the hopeless cases. cdnt help but notice ashmore group – an EM specialist – has been knocked down to 2.2bn market cap – and they have 75.3 bn under management, which makes it priced @2.9% of AUM. i am trying to remember your formula and can’t – is that expensive or cheap? Essentially, it’s the same underlying formula – with a twist. And it’s probably far more consistent, as fee rates & revenue can vary wildly per manager, but any decent manager (regardless of their specialty) should be able to clock up at least a 25-35% (or higher) operating margin – so Price/Sales multiples should be far more similar also. The trouble with doing DCF analysis of junior resource stocks – if you start with some really large (& almost entirely notional) numbers, you still end up with fairly big numbers no matter how heavily you discount. [I’m sure somebody could come up with big numbers for FAST:LN in similar fashion]. Frankly, once you go much beyond proved & probable (& occasionally possible) reserves, it’s almost impossible to properly price in the level of uncertainty, operational risk, financing issues, managerial issues, dilution, etc. investors actually face. So I don’t – it avoids a lot of disasters!